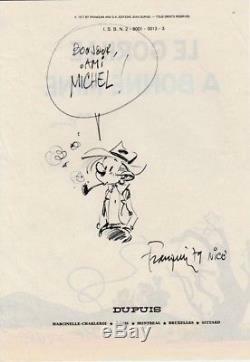 André franquin (1924 - 1997), Belgian comic book author. Rare fantasy drawing with fine felt tip on the back cover of the album "the Gorilla looks good\The item "andré franquin original drawing fantasio" is on sale since Monday, June 25, 2018. It is in the category "books, comics, magazines \ bd \ boards, original drawings".